Marks and years (approximate): all models until 1987 (inclusive). Typical arrangement: under the hood. Marks and years (approximate): all models 1988-2000. Typical location: under the hood, closed with a twist-off plastic cover. Einspritzanlagen - the engine management system is faulty. Motornotprogramm - the engine management system went into emergency operation mode. Kuhlwassertemperatur - engine (motor) overheating detected. Kuhlwasserst. prufen - low level of coolant in the engine (motor). Stop! Oldruck Motor - muffle the engine, low oil pressure! Olstand Motor prufen - low oil level in the engine. Bremsflussigk, prufen - low brake fluid level in the braking system. Bremsbelag prufen - brake pads are worn out. Getriebenotprpgramm - AKPP passed the emergency mode of operation. Bremslicht prufen - one or both brake lights do not work. Abblendlicht prufen - the dipped beam does not work. Rucklicht prufen and Standlicht prufen - incorrect operation of parking lights. Nebellicht hinten prufen and Nebellicht vorn prufen - incorrect operation of the front or rear fog lamps. Kennzeichenlicht prifen - the license plate light does not work. Fernlicht prufen - incorrect operation of the main beam headlights. Ruckfahricht prufen - incorrect operation of reversing lamps. Limit - speed is exceeded. Niveaurregel, inaktiv - a malfunction in the system of adjusting the clearance (clearance). Parkbremse lossen - the handbrake is faulty or activated. Kofferraum offen - the trunk is open. Tur offen - one or more doors are not closed. Gurt angelen - an indicator of seat belts not fastened. Funkschlussel-Batt - you need to replace the batteries in the remote control. Vorgluhen - glow plugs are warming up. Waschwasser fulen - low level of washer fluid. 01 - air flow sensor or its circuit. 02 - oxygen sensor (lambda probe) or its circuit. 03 - the coolant temperature sensor or its circuit. 04 - throttle position sensor. 01 - Malfunction of the engine-ECU (ECU). 03 - a fault in the fuel pump relay or its circuit. 04 - malfunction of the idle speed regulator or its circuit. 05 - malfunction of the adsorber valve or its circuit. 07 - malfunction of the air flow sensor or its circuit. 10 - oxygen sensor (lambda probe) - output of the value beyond the permissible limits. 15 - fault indication (USA). 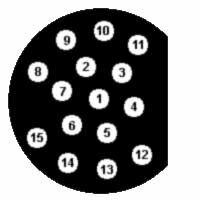 16 - incorrect operation of injectors 1-3 cylinders or malfunction of their circuit. 17 - incorrect operation of injectors 2-4 cylinders or malfunction of their circuit. 23 - malfunction of the oxygen sensor (lambda probe) heating circuit. 28 - malfunction of the oxygen sensor (lambda probe). 29 - malfunction of the speedometer sensor. 33 - incorrect operation of the torque converter lock solenoid. 37 - the voltage in the on-board network is higher than 16 volts. 43 - exhaust gas potentiometer (for models without catalyst). 44 - air temperature sensor malfunction. 45 - malfunction of the coolant temperature sensor. 51 - incorrect position of the ignition timing. 52,53 - incorrect operation of the throttle position sensor. 54 - mechanical failure of the clutch of the torque converter lock-up. 100 - malfunction of the ignition switch. 101 - the motor is defective. 000 - no error codes were found. 001 - a fault in the fuel pump relay or its circuit. 002 - malfunction of the idle speed regulator or its circuit. 003 - malfunction of injector of 1st cylinder. 004 - malfunction of the 3rd cylinder injector. 005 - malfunction of the 2nd cylinder injector. 006 - general malfunction of control of injectors or their circuits. 012 - malfunction of the throttle position sensor. 016 - Malfunction of the crankshaft position sensor. 018 - malfunction of the amplifier on the 18 m track of the computer. 023 - malfunction of ignition system of 2nd cylinder. 024 - malfunction of ignition system of 3rd cylinder. 025 - malfunction of ignition system of 1st cylinder. 026 - computer power failure. 029 - malfunction of the idle speed regulator. 031 - malfunction of the 5th cylinder injector. 032 - malfunction of the 6th cylinder injector. 033 - malfunction of the injector of the cylinder. 036 - malfunction of the coal adsorber valve. 037 - malfunction of the oxygen sensor (lambda probe). 041 - malfunction of the mass air flow sensor. 048 - malfunction of air conditioning compressor or air conditioner circuit. 050 - malfunction of the ignition system of the 4th cylinder. 051 - malfunction of the ignition system of the 6th cylinder. 055 - malfunction of the ignition switch or its circuit. 062 - electronic throttle malfunction. 064 - incorrect ignition timing (for vehicle with automatic transmission). 067 - Malfunction of the crankshaft position sensor. 070 - malfunction of the oxygen sensor. 073 - the speedometer sensor or its circuit is not functioning correctly. 077 - Inlet temperature sensor malfunction. 078 - malfunction of the coolant temperature sensor. 081 - faulty burglar alarm system. 082 - malfunction of traction control system. 083 - malfunction of the suspension control system. 085 - malfunction of the air conditioning compressor or its circuit. 201 - malfunction of the oxygen sensor. 203 - primary ignition circuit malfunction. 204 - an incorrect throttle control signal. 0 - internal computer fault. 01 - malfunction of ignition system of 1st cylinder. 02 - the ignition system of the 4th cylinder is malfunctioning. 03 - malfunction of ignition system of 6th cylinder. 05 - an open or short circuit of the injector circuit 2. 06 - an open or short circuit of the injector circuit 1. 08 - air flow sensor malfunction. 10 OA - malfunction of the coolant temperature sensor. 11 OB - Malfunction of the EVAP system pressure sensor (fuel vapor trapping). 12 OC - open or short in the throttle potentiometer circuit. 14 OE - Incoming air temperature sensor malfunction. 16 10 - incorrect air conditioning compressor signal. 18 12 - the car anti-theft system (immobilizer) was activated. 20 14 - malfunction of lamp check engine. 21 15 - malfunction of the camshaft position sensor. 22 16 - malfunction of the 3rd cylinder injector. 23 17 - malfunction of the 6th cylinder injector. 24 18 - malfunction of the fourth cylinder injector. 25 19 - malfunction of heating the oxygen sensor bank 1 sensor 1 (1-2-3 cylinders). 27 1B - malfunction of the idle air control valve. 29 1D - malfunction of ignition system of 1st cylinder. 30 1E - malfunction of ignition system of 3rd cylinder. 31 1F - malfunction of ignition system of 5th cylinder. 33 21 - malfunction of the 5th cylinder injector. 35 23 - malfunction of the air pump of the mixed air system. 51 33 - malfunction of the cut-off valve. 52 34 - malfunction of the exhaust gas control system. 53 35 - malfunction of the valve of idling. 55 37 - malfunction of the oxygen sensor heating circuit bank 1 sensor 2 (4-5-6 cylinders). 56 38 - Ignition signal resistor malfunction. 57 39 - knock sensor malfunction 1. 59 3B - malfunction of the knock sensor 2. 61 3D - Malfunction of the heating circuit of the oxygen sensor bank 2 sensor 2 (after the catalyst, 4-5-6 cylinders). 62 3E - Malfunction of the air mixing control switching valve. 65 41 - malfunction of the camshaft position sensor. 68 44 - Malfunction of the EVAP purge valve (coal adsorption system). 69 45 - Fuel pump relay failure. 74 4A - A / C compressor relay failure. 75 4B - malfunction of the oxygen sensor heating circuit bank 2 sensor 1 (after catalyst 1-2-3 cylinders). 76 4C - the wrong signal of the oxygen sensor bank 1 sensor 2 (up to catalyst 4-5-6 cylinders). 77 4D - wrong signal of oxygen sensor bank 1 sensor 1 (up to catalyst 1-2-3 cylinders). 78 4E - the wrong signal of the oxygen sensor bank 2 sensor 2 (after catalyst 4-5-6 cylinders). 79 4F - invalid oxygen sensor signal bank 2 sensor 1 (after catalyst 1-2-3 cylinders). 80 50 - incorrect transfer of data from the ABS / ESP control unit - ignition suppression. 81 51 - incorrect transfer of data from the ABS / ESP control unit - increase of idling speed. 82 52 - incorrect transfer of data from the ABS / ESP control unit - ignition timing adjustment. 83 53 - malfunction of the crankshaft position sensor. 100 64 - computer faulty. 190 BE - there is no short-circuit on the reed switch of the EVAP system (98 model year). 191 BF - permanent closure (no disconnection) of the reed switch of the EVAP system (98-year-old cars). 192 C0 - the reed switch of the EVAP system does not turn off (cars of 98th year of release). 194 C2 - significant leakage in the EVAP system (cars of 98th year of release). 195 C3 - insignificant leak in the EVAP system (cars of 98th year of release). 196 C4 - malfunction of the LDP valve of the EVAP system (cars of 98th year of production). 197 C5 - Malfunction of the atmospheric pressure sensor of the EVAP system (cars of 98th year of production). 200 C8 - malfunction of the oxygen sensor bank 1 sensor 1 (lambda probe up to catalyst 1-2-3 cylinders). 201 C9 - malfunction of oxygen sensor bank 1sensor 2 (lambda probe up to catalyst 4-5-6 cylinders). 202 CA - invalid signal from oxygen sensor bank 1 sensor 1 (lambda probe up to catalyst 1-2-3 cylinders). 203 CB - incorrect signal from the oxygen sensor bank 1 sensor 2 (lambda probe up to catalyst 4-5-6 cylinders). 204 CC - idle speed - out of adaptation (that is, they differ from the limit values). 209 D1 - activation of the standard anti-theft system (immobilizer). 210 D2 - general malfunction of the ignition system. 211 D3 - idling valve mechanical failure. 212 D4 - camshaft position actuator mechanical damage. 214 D6 - invalid speed sensor signal. 215 D7 - ABS system diagnosis line - an open or short circuit. 216 D8 - unreliable data of the diagnosis line of the automatic transmission control unit. 217 D9 - a fault in the diagnosis line of the automatic transmission control unit. 227 E3 - incorrect mixture formation 1-2-3 cylinders. 228 E4 - incorrect mixture formation 4-5-6 cylinders. 229 E5 - delayed response of the oxygen sensor bank 1 sensor 1 (up to catalyst 1-2-3 cylinder). 230 E6 - delayed response of the oxygen sensor bank 1 sensor 1 (up to catalyst 4-5-6 cylinder). 233 E9 - low efficiency of the catalytic converter (catalysts 1-2-3 cylinders). 234 EA - low efficiency catalytic converter (catalyst 4-5-6 cylinders). 235 EB - malfunction of the oxygen sensor heating circuit bank 2 sensor 1 (after catalyst 1-2-3 cylinders). 236 EC - malfunction of the oxygen sensor heating circuit bank 2 sensor 1 (after catalyst 4-5-6 cylinders). 238 EE - misfires detected in 1 m cylinder. 239 EF - misfires detected in the 2nd cylinder. 240 F0 - misfires detected in the 3 m cylinder. 241 F1 - misfires detected in the 4 m cylinder. 242 F2 - misfires detected in a 5 m cylinder. 243 F3 - misfires detected in the 6 m cylinder. P0100 - Malfunction of the air flow sensor circuit. P0101 - Signal from the air flow sensor - out of adaptation (out of range). P0102 - Low level of the output signal of the air flow sensor. P0103 - High level of the output signal of the air flow sensor. P0105 - Air Pressure Sensor Circuit Malfunction. P0106 - Absolute pressure sensor signal - out of adaptation (out of range). P0107 - The output signal of the air pressure sensor is low. P0108 - The output signal of the air pressure sensor is a high level. P0110 - Incoming air temperature sensor fault (IAT - sensor). P0111 - Incoming air temperature sensor signal (IAT - sensor) - out of adaptation. P0112 - Inlet air temperature sensor (IAT - sensor) - low signal level. P0113 - Inlet air temperature sensor (IAT - sensor) - high signal level. P0115 - The coolant temperature sensor is faulty. P0116 - Coolant temperature sensor signal - out of range. P0117 - The coolant temperature sensor is low. P0118 - Coolant temperature sensor - high. P0120 - The throttle position sensor "A" is defective. P0121 - Throttle position sensor signal "A" - out of adaptation. P0122 - The output signal of the throttle position sensor "A" is low. P0123 - The output signal of the throttle position sensor "A" is a high level. P0125 - Insufficient coolant temperature for closed loop control. P0130 - The oxygen sensor bank 1 sensor 1 (before catalyst) is defective. P0131 - The oxygen sensor bank 1 sensor 1 (up to the catalyst) - low signal level. P0132 - The oxygen sensor bank 1 sensor 1 (up to the catalyst) - high signal level. P0133 - Slow response of the oxygen sensor bank 1 sensor 1 (before the catalyst) to enrich / deplete the mixture. P0134 - No activity of the oxygen sensor output bank 1 sensor 1 (before catalyst). P0135 - Bank 1 sensor 1 oxygen sensor heating circuit malfunction (before catalytic converter). P0136 - The oxygen sensor bank 1 sensor 2 (before the catalyst) is defective. P0137 - The oxygen sensor bank 1 sensor 2 (before the catalyst) - low signal level. P0138 - The oxygen sensor bank 1 sensor 2 (up to the catalyst) - high signal level. P0139 - Slow response of the oxygen sensor bank 1 sensor 2 (before the catalyst) to enrich / deplete the mixture. P0140 - There is no activity of the output signal of the oxygen sensor bank 1 sensor 2 (before the catalyst). P0141 - Bank 1 sensor 2 oxygen sensor heating circuit fault (before catalytic converter). P0142 - The oxygen sensor bank 1 sensor 3 (before the catalyst) is defective. P0143 - The oxygen sensor bank 1 sensor 3 (up to the catalyst) - low signal level. P0144 - The oxygen sensor bank 1 sensor 3 (up to the catalyst) - high signal level. P0145 - Slow response of the oxygen sensor bank 1 sensor 3 (before the catalyst) to enrich / deplete the mixture. P0146 - There is no activity of the output signal of the oxygen sensor bank 1 sensor 3 (before the catalyst). P0147 - Bank 1 sensor 3 oxygen sensor heating circuit malfunction (before catalytic converter). P0150 - The oxygen sensor bank 2 sensor 1 (after catalytic converter) is defective. P0151 - Oxygen sensor bank 2 sensor 1 (after catalytic converter) - low signal level. P0152 - Oxygen sensor bank 2 sensor 1 (after catalytic converter) - high signal level. P0153 - Slow response of the oxygen sensor bank 2 sensor 1 (after the catalyst) to enrich / deplete the mixture. P0154 - No activity of the oxygen sensor output of bank 2 sensor 1 (after catalytic converter). P0155 - Malfunction of the oxygen 2 sensor 1 heating circuit (after catalytic converter). P0156 - The oxygen sensor bank 2 sensor 2 (after catalytic converter) is defective. P0157 - The oxygen sensor bank 2 sensor 2 (after the catalyst) - low signal level. P0158 - The oxygen sensor bank 2 sensor 2 (after the catalyst) - high signal level. P0159 - Slow response of the oxygen sensor bank 2 sensor 2 (after the catalyst) to enrich / deplete the mixture. P0160 - There is no activity of the oxygen sensor output of bank 2 sensor 2 (after catalytic converter). P0161 - Malfunction of oxygen bank 2 sensor 2 heating circuit (after catalytic converter). P0162 - The oxygen sensor bank 2 sensor 3 (after catalytic converter) is defective. P0163 - The oxygen sensor bank 2 sensor 3 (after the catalyst) - low signal level. P0164 - The oxygen sensor bank 2 sensor 3 (after the catalyst) - high signal level. P0165 - Slow response of the oxygen sensor bank 2 sensor 3 (after the catalyst) to enrich / deplete the mixture. P0166 - No activity of the oxygen sensor output of bank 2 sensor 3 (after catalytic converter). P0167 - Malfunction of oxygen bank 2 sensor 3 heating circuit (after catalytic converter). P0171 - Lean mixture (air can be sucked in the system). P0172 - Too rich a mixture. P0173 - Possible fuel leak in the cylinder block 2. P0174 -Extended mixture in the cylinder block 2. P0175 - Too rich mixture in the cylinder block 2. P0176 - Chain of the exhaust gas sensor circuit CHX (Fuel Composition). P0177 - Exhaust Gas Sensor Signal CHX (Fuel Composition) - out of adaptation. P0178 - Signal from the exhaust gas sensor SNh (Fuel Composition) - low. P0179 - Signal from the exhaust gas sensor CHh (Fuel Composition) - high level. P0180 - Fault in fuel temperature sensor circuit "A". P0181 - Fuel temperature sensor signal "A" - out of adaptation. P0182 - Fuel temperature sensor "A" signal is low. P0183 - Fuel temperature sensor signal "A" - high level. P0185 - Fault in the fuel temperature sensor circuit "B". P0186 - Fuel temperature sensor signal "B" - out of adaptation. P0187 - Fuel temperature sensor signal "B" is low. P0188 - Fuel temperature sensor signal "B" - high level. P0190 - Fuel rail fuel pressure sensor circuit faulty. P0191 - Fuel rail pressure sensor signal - out of adaptation. P0192 - Fuel rail pressure sensor signal - low. P0193 - Fuel rail pressure sensor signal - high. P0194 - Invalid fuel rail pressure sensor signal. P0195 - Engine oil temperature sensor circuit faulty. P0196 - Engine oil temperature sensor signal - Out of range adaptation. P0197 - Engine oil temperature sensor signal is low. P0198 - Engine oil temperature sensor signal - high. P0199 - Invalid signal from engine oil temperature sensor. P0200 - Malfunction in the injector control circuit. P0201 - Malfunction of injector control circuit of 1st cylinder. P0202 - Malfunction of injector control circuit of 2nd cylinder. P0203 - Malfunction of injector control circuit of 3rd cylinder. P0204 - Malfunction of injector control circuit of 4th cylinder. P0205 - Faulty injector control circuit for 5th cylinder. P0206 - Faulty injector control circuit of the 6th cylinder. P0207 - 7th cylinder injector control circuit malfunction. P0208 - Malfunction of the control circuit of the 8th cylinder injector. P0209 - Malfunction of the control circuit of the 9th cylinder injector. P0210 - Malfunction of the control circuit of the 10th cylinder injector. P0211 - Malfunction of the control circuit of the 11th cylinder injector. P0212 - Malfunction of the control circuit of the 12th cylinder injector. P0213 - Cold start injector control circuit 1 is defective. P0214 - Cold start injector control circuit 2 malfunction. P0215 - Engine shutdown valve malfunction. P0216 - Ignition timing adjustment fault. P0219 - The permissible engine speed has been exceeded. P0220 - Throttle Position Sensor "B" Malfunction. P0221 - Throttle position sensor signal "B" - out of adaptation. P0222 - Throttle position sensor signal "B" - low. P0223 - Throttle position sensor signal "B" - high. P0224 - Invalid throttle position sensor signal "B". P0225 - Throttle position sensor "C" fault. P0226 - Throttle position sensor signal "C" - out of adaptation. P0227 - Throttle position sensor signal "C" - low. P0228 - Throttle position sensor signal "C" - high. P0229 - Invalid throttle position sensor signal "C". P0230 - Fault in the primary control circuit of the petrol pump. P0231 - Low level of the secondary circuit of the gasoline pump (permanently). P0232 - High level of the secondary circuit of the gasoline pump (permanently). P0233 - The unreliable level of the secondary circuit of the gasoline pump. P0235 - Turbocharger pressure sensor circuit "A". P0236 - Turbine sensor signal "A" - out of adaptation. P0237 - The signal from the turbine sensor "A" is low. P0238 - The signal from the turbine sensor "A" is a high level. P0239 - Turbocharger pressure sensor circuit "B" is faulty. P0240 - Signal from the turbine sensor "B" - out of adaptation. P0241 - The signal from the turbine sensor "B" is low. P0242 - The signal from the turbine sensor "B" is a high level. P0243 - Turbine "A" exhaust gas valve solenoid malfunction. P0244 - Turbine exhaust valve solenoid signal "A" - out of adaptation. P0245 - Turbine "A" exhaust gas solenoid - always open. P0246 - Turbine "A" exhaust gas shut-off solenoid - always closed. P0247 - Turbine "B" exhaust gas valve solenoid malfunction. P0248 - Turbine exhaust valve solenoid signal "B" - out of adaptation. P0249 - Turbine "B" exhaust gas solenoid - always open. P0250 - Turbine "B" exhaust gas solenoid - always closed. P0251 - Malfunction of the turbocharger injection pump "A". P0252 - Turbine injection pump signal "A" - out of adaptation. P0253 - Turbine injection pump signal "A" - low level. P0254 - Turbine injection pump signal "A" - high level. P0255 - The turbine "A" injection pump signal is not correct. P0256 - Malfunction of the turbocharger injection pump "B". P0257 - Turbine injection pump signal "B" - out of adaptation. P0258 - Turbine injection pump signal "B" is low. P0259 - Turbine injection pump signal "B" - high level. P0260 - The turbine "B" injection pump signal is not correct. P0261 - Nozzle of 1st cylinder - short to ground. P0262 - Injector 1 cylinder - an open or short circuit to +. P0263 - Malfunction of the 1st cylinder injector driver. P0264 - Injector 2 cylinder - short circuit to "-". P0265 - Nozzle of 2nd cylinder - open circuit or short circuit to "+". P0266 - Malfunction of the 2nd cylinder injector driver. P0267 - Injector 3 cylinder - short to "-". P0268 - Nozzle of 3rd cylinder - open circuit or short circuit to "+". P0269 - Malfunction of the 3rd cylinder injector driver. P0270 - Fourth cylinder injector - short to "-". P0271 - Fourth cylinder injector - open circuit or short circuit to "+". P0272 - Malfunction of the 4th cylinder injector driver. P0273 - Injector of 5th cylinder - short circuit to "-". P0274 - Injector of 5th cylinder - open circuit or short circuit to "+". P0275 - Fault in the 5th cylinder injector driver. P0276 - Nozzle of the 6th cylinder - short to "-". P0277 - Nozzle of the 6th cylinder - open circuit or short circuit to "+". P0278 - Malfunction of the 6th cylinder injector driver. P0279 - Nozzle of the 7th cylinder - short to "-". P0280 - Nozzle of the 7th cylinder - open circuit or short circuit to "+". P0281 - Malfunction of the 7th cylinder injector driver. P0282 - Nozzle of the 8th cylinder - short to "-". P0283 - Nozzle of the 8th cylinder - open circuit or short circuit to "+". P0284 - Malfunction of the 8-cylinder injector driver. P0285 - Nozzle of the 9th cylinder - short to "-". P0286 - Nozzle of the 9th cylinder - open circuit or short circuit to "+". P0287 - Malfunction of the 9th cylinder injector driver. P0288 - Nozzle of the 10th cylinder - short to "-". 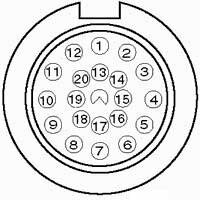 P0289 - Nozzle of the 10th cylinder - open circuit or short circuit to "+". P0290 - Malfunction of the 10th cylinder injector driver. P0291 - Nozzle of the 11th cylinder - short to "-". P0292 - Injector 11 of the cylinder - open circuit or short circuit to "+". P0293 - Malfunction of the 11th cylinder injector driver. P0294 - Nozzle of the 12th cylinder - short to "-". P0295 - Nozzle of the 12th cylinder - open circuit or short circuit to "+". P0296 - Malfunction of the 12-cylinder injector driver. P0300 - Ignition misfires detected. P0301 - Ignition omissions of the 1st cylinder. P0302 - Ignition misfires of the 2nd cylinder. P0303 - The misfiring of the 3rd cylinder. P0304 - Ignition omissions of the 4th cylinder. P0305 - The misfiring of the 5th cylinder. P0306 - Ignition interlocks of the 6th cylinder. P0307 - Ignition interlocks of the 7th cylinder. P0308 - Ignition interlocks of the 8th cylinder. P0309 - Ignition omissions of the 9th cylinder. P0310 - Ignition omissions of the 10th cylinder. P0311 - Ignition omissions of the 11th cylinder. P0312 - Ignition misfires of the 12th cylinder. P0320 - Fault in the ignition distributor circuit. P0321 - Ignition distributor signal - out of adaptation. P0322 - There is no signal from the ignition distributor. P0323 - Wrong signal from the ignition distributor. P0325 - Malfunction in the knock sensor circuit "1". P0326 - Knock sensor signal "1" - out of adaptation. P0327 - The signal from the knock sensor "1" is low. P0328 - The signal from the knock sensor "1" is high. P0329 - Invalid knock sensor signal "1". P0330 - Malfunction in the detonation sensor circuit "2". P0331 - Knock sensor signal "2" - out of adaptation. P0332 - The signal from the knock sensor "2" is low. P0333 - The signal from the knock sensor "2" is a high level. P0334 - The knock sensor signal "2" is not valid. P0335 - Crankshaft Position Sensor Error "A". P0336 - Error of the crankshaft position sensor "A" - missing one tooth. P0337 - Low level or short to "-" position sensor of crankshaft "A". P0338 - High or short to "+" crankshaft position sensor "A". P0339 - Invalid signal of the crankshaft position sensor "A". P0340 - Camshaft sensor fault. P0341 - Camshaft sensor signal - Out of range adaptation. P0342 - The signal of the camshaft sensor is low. P0343 - Camshaft Sensor Signal - High. P0344 - Invalid signal from the camshaft sensor. P0350 - Ignition coil primary / secondary circuit malfunction. P0351 - Primary / secondary circuit of ignition coil "A". P0352 - Primary / secondary circuit of ignition coil "B". P0353 - Primary / secondary circuit of the ignition coil "C". P0354 - Primary / secondary circuit of the ignition coil "D". P0355 - Primary / secondary circuit of the ignition coil "E". P0356 - Primary / secondary circuit of the ignition coil »F». P0357 - Primary / secondary circuit of the ignition coil "G". P0358 - Malfunction of primary / secondary circuit of ignition coil "H". P0359 - Primary / secondary circuit of the ignition coil "I". P0360 - Primary / secondary circuit of the ignition coil "J". P0361 - Malfunction of primary / secondary circuit of ignition coil "K". P0362 - Primary / secondary circuit of the ignition coil "L". P0370 - A high reference reference circuit fault A of the ignition timing control. P0371 - Fault in the reference signal circuit of high-resolution A control for setting the ignition timing (excessive number of pulses). P0372 - Fault in the reference signal circuit of high resolution A of the ignition timing control (insufficient number of pulses). P0373 - Sporadic malfunction in the high-resolution reference signal circuit A of the ignition timing control (pulse arrhythmia). P0374 - Fault in the high-reference reference signal circuit A of the ignition timing control (no pulses). P0375 - Malfunction in the reference signal circuit of high resolution In the control of the ignition timing setting. P0376 - Malfunction in the reference signal circuit of high resolution In controlling the setting of the ignition timing (excessive number of pulses). P0377 - Malfunction in the reference signal circuit of high resolution In the control of the ignition timing setting (insufficient number of pulses). P0378 - Sporadic malfunction in the reference signal circuit of high resolution In controlling the setting of the ignition timing (disturbance of the rhythm of the pulses). P0379 - Malfunction in the reference signal circuit of high resolution In the control of setting the ignition timing (no pulses) ..
P0380 - Malfunction of glow plug or heating circuit. P0381 - Malfunction in circuit A of the glow plug heating indicator. P0385 - Malfunction in the crankshaft position sensor circuit "B". P0386 - Crankshaft Position Sensor "B" signal - out of adaptation. P0387 - Low or short to "-" position sensor of crankshaft "B". P0388 - High or "+" position of the crankshaft position sensor "B". P0389 - The crankshaft position sensor signal "B" is not valid. P0400 - Malfunction of the EGR (Exhaust Gas Recirculation) system. P0401 - Low efficiency of the EGR system. P0402 - Malfunction in the EGR backpressure sensor circuit. P0403 - EGR system sensor circuit fault (exhaust gas recirculation). P0404 - EGR System Sensor Signal (Exhaust Gas Recirculation) - Out of range adaptation. P0405 - Short to the "E" sensor circuit of the EGR valve. P0406 - Short to + sensor circuit "A" of the EGR valve. P0407 - Short to the "E" sensor circuit "B". P0408 - Short to + sensor circuit "B" of the EGR valve. P0410 - Malfunction of the secondary air supply system. P0411 - Incorrect flow detection by the additional air mixing system. P0412 - Malfunction of the secondary air system valve "A". P0413 - Secondary air supply system "A" - the valve is always open. P0414 - Secondary air supply system "A" - the valve is always closed. P0415 - Malfunction of the secondary air supply valve "B". P0416 - Secondary air supply system "B" - the valve is always open. P0417 - Secondary air supply system "B" - the valve is always closed. P0420 - The efficiency of the catalyst system B1 is below the allowable limit. P0421 - The heating efficiency of catalysts B1 is below the allowable limit. P0422 - The efficiency of the main catalyst B1 is below the allowable limit. P0423 - The efficiency of the catalyst heater B1 is below the allowable limit. P0424 - The temperature of the catalyst heater B1 is below the permissible limit. P0430 - The efficiency of the catalyst system B2 is below the allowable limit. P0431 - The efficiency of heating of catalysts B3 is below the permissible limit. P0432 - The efficiency of the main catalyst B2 is below the allowable limit. P0433 - The efficiency of the catalytic converter (catalyst) B2 heater is below the permissible limit. P0434 - The temperature of the heater of the catalytic converter (catalyst) B2 is below the permissible limit. P0440 - Malfunction of monitoring the vapor recovery system. P0441 - Petrol vapor recovery system - low permeability. P0442 - Minor leakage in the gasoline vapor recovery system. P0443 - Fuel purge system purge valve circuit fault. P0444 - Purge valve for vapor recovery system - continuously open. P0445 - Purge valve for vapor recovery system - permanently closed. P0446 - Malfunction in the ventilation circuit of the fuel vapor outlet monitoring system. P0447 - The air valve of the vapor recovery system is permanently open. P0448 - The air valve of the vapor recovery system is permanently closed. P0450 - Gasoline vapor pressure sensor malfunction. P0451 - Signal of the vapor pressure sensor of gasoline - out of adaptation. P0452 - The signal of the petrol vapor pressure sensor is low. P0453 - Signal of the vapor pressure sensor of gasoline - high level. P0454 - Invalid signal from the vapor pressure sensor of gasoline. P0455 - A significant leak in the gasoline vapor recovery system has been detected. P0460 - Fuel Level Sensor Circuit Malfunction. P0461 - Fuel Level Sensor Signal - Out of Adaptation. P0462 - Fuel Level Sensor Signal - Low. P0463 - Fuel Level Sensor Signal - High. P0464 - Invalid fuel level sensor signal. P0465 - Airflow Sensor Circuit Malfunction. P0466 - Airflow sensor signal - out of adaptation. P0467 - The airflow sensor signal is low. P0468 - Airflow sensor signal is high. P0469 - Invalid signal level of the air flow sensor. P0470 - Exhaust gas pressure sensor malfunction. P0471 - Exhaust gas pressure sensor signal - out of adaptation. P0472 - Exhaust gas pressure sensor signal - low. P0473 - Exhaust Gas Pressure Sensor Signal - High. P0474 - Invalid signal level of the exhaust gas pressure sensor. P0475 - Exhaust gas pressure sensor defective. P0476 - Exhaust gas pressure sensor valve signal - out of adaptation. P0477 - Exhaust gas pressure sensor valve signal is low. P0478 - Exhaust gas pressure sensor valve signal - high. P0479 - Invalid signal level of the exhaust gas pressure sensor valve. P0480 - Fault in the fan relay control circuit. P0500 - There is no signal from the vehicle speed sensor. P0501 - Vehicle speed sensor signal is out of adaptation. P0502 - Signal from vehicle speed sensor - low. P0503 - Signal from vehicle speed sensor - high. P0505 - Idle speed controller malfunction. P0506 - Idle speed controller malfunction - low speed. P0507 - Malfunction of the regulator of idling - increased speed.